On a local and grassroots level, non-governmental organizations (NGO’s) and individuals across the MENA region are working to empower youth. Youth empowerment is an engagement strategy where young people are encouraged to take ownership of their lives by making choices and taking actions that will improve their access to resources and transform their lives. By providing training, workshops, and mentoring, NGO’s and change-makers hope to empower the young people to take control of their futures. Muhammad Mansour, another of the Egyptian fellow believes, “that youth empowerment should be one of the core outcomes of any government’s economic and social transformation agenda.” The United Nations agrees with him. It recognized the importance of incorporating youth focused policies into comprehensive and sustainable development strategies, subsequently adding it as Goal 8 of the 2030 Agenda for Sustainable Development. The focus on youth empowerment is made even clearer when you look at the 2018 Fall Professional Fellows Program. 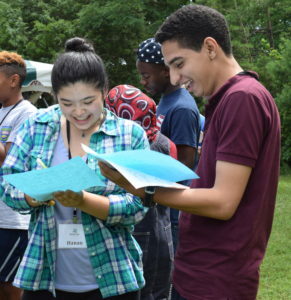 Whether through their jobs or their volunteer work, 75% of Legacy’s Fellows are engaged with youth empowerment, with many targeting young women specifically. Najla Almissalati, a Libyan Fellow, worked with her peers to launch their own non-profit called “She Codes.” Their objective is to empower women and children with coding skills, to bridge the gender gap in the industry, and to inspire women proactivity and self-reliance throughout Libya. While youth empowerment is an a noble goal, it does not exist in a vacuum. It can be hampered by the other systemic challenges facing the MENA region as a whole. However, if this group of Pro Fellows is reflective of the caliber of the change-makers working across the region to empower today’s young people, then they are well on their way of making the goal a reality.